Railpictures.ca - Tony Bock Photo: The last pair of a Nedrail (Netherlands) order for ten JT42CWR (EMD Class 66) locomotives are test run on the Trillium Railway in May 2006. ITS Rail assembled the locomotives under subcontract to EMD, at the ITS Rail plant in St. Catharines, ON. The locomotives wait in Merritton yard for a Hamilton bound CN freight to clear so they can cross the Grimsby Sub and head south towards Thorold. Its unusual to see equipment built to the smaller European loading gauge alongside the somewhat larger North American rolling stock. In the background, a Niagara bound train crosses the bridge over the Welland Canal. | Railpictures.ca – Canadian Railway Photography – photographie ferroviaire Canadienne. Copyright Notice: This image ©Tony Bock all rights reserved. Caption: The last pair of a Nedrail (Netherlands) order for ten JT42CWR (EMD Class 66) locomotives are test run on the Trillium Railway in May 2006. ITS Rail assembled the locomotives under subcontract to EMD, at the ITS Rail plant in St. Catharines, ON. 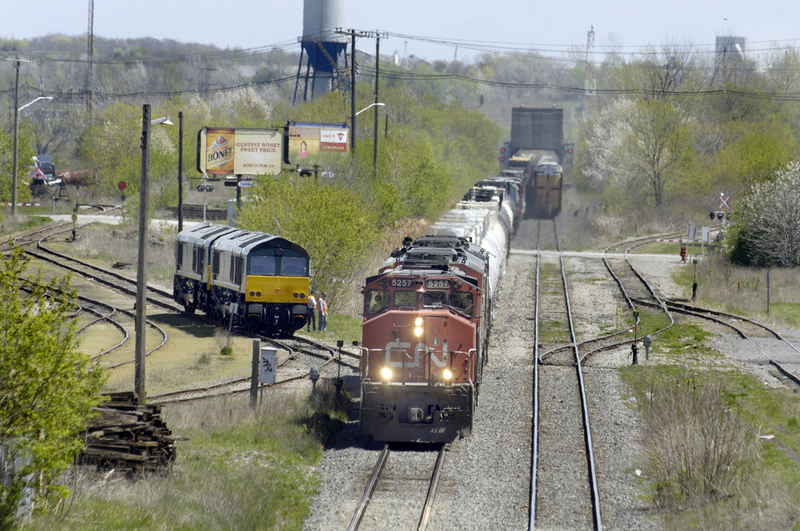 The locomotives wait in Merritton yard for a Hamilton bound CN freight to clear so they can cross the Grimsby Sub and head south towards Thorold. Its unusual to see equipment built to the smaller European loading gauge alongside the somewhat larger North American rolling stock. In the background, a Niagara bound train crosses the bridge over the Welland Canal. This is the photo which could be paired in the Time Machine with Arnold Mooney’s 1980 photo of the bullet nose train. This photo demonstrates how much that area – where the Merritton train station used to be – has changed since 1980. Without the water tower and the trestle across the Welland Canal, I never would have recognized this area as being Merritton. Even with those landmarks – of sorts – it looks nothing like I remember it. The road crossing is indeed Glendale Ave. The track layout was changed about ten years ago (I’m guessing at that date), when the Merritt Road bridge was rebuilt. The crossover is now about a half mile west which makes quite a lengthy move when Trillium has a train heading south down the Thorold sub. That’s Glendale which the approaching train is crossing? If so, I hardly recognize that area anymore. Loving these Merriton shots..please keep em coming!